My Asus ROG STRIX GTX 1080 has two PWM-connectors for external fans. 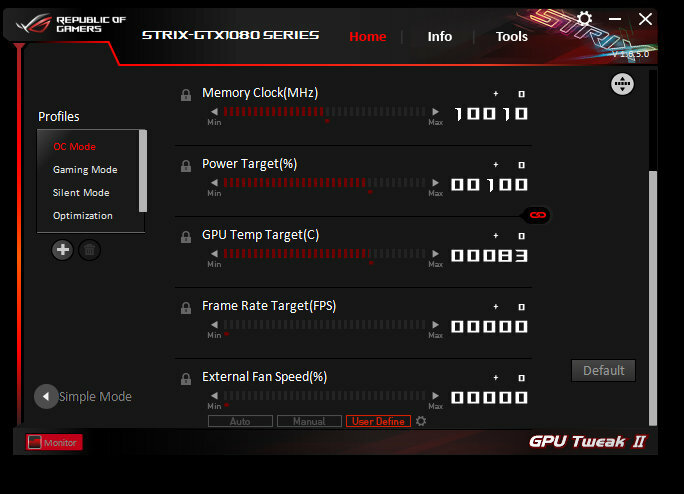 GPU Tweak II (Software from Asus) could read and display the fan speed of these external fans, is there a way to display this in AIDA (Sensor Panel) too? Please right-click on the bottom status bar of AIDA64 main window --> Video Debug --> nVIDIA GPU Registers. Copy-paste the full results into this topic, or attach the results as a TXT file to your post. You may need to enable status bar in AIDA64 / main menu / View first. Then right-click on the bottom status bar of AIDA64 main window --> Video Debug --> nVIDIA SMBus Dump. Copy-paste the full results into this topic, or attach the results as a TXT file to your post. Please also let us know the approx. RPM that the fans are spinning while you're creating those dumps. GPU Tweak II shows only the external fan speed in percent and not the rpm. While creating the dumps I set the fan speed manually to 100 percent. Thank you! Please also set the first external fan to 33%, and the second external fan to 62%, and repeat the nVIDIA SMBus Dump, so we can check which registers changed. If you have a bit more time to play around with those settings, please send us another nVIDIA SMBus Dump with the first external fan set to 17%, and the second external fan to 88%. In these dumps is only one fan connected. Tomorrow I connect a second fan and make the requested dumps. there is no way to separately control the 1st and the 2nd external fan with Asus GPU Tweak II, even with the latest beta Version 1.8.3.5. Both external fans have always the same fan speed. But for the dumps I connected two external fans as requested, beginning with 26% (the lowest fan speed that Auto Calibration allows. I noticed that external fan speed in percent is implemented in the latest beta. My Asus GTX 1080 is semi passive and I configured it so, that fans started at 55°C with 35%. AIDA64 is reporting this fine, but with something like a kind of time lag. Sensor Display starts with 2-3% and than goes in steps from 2-3% until 35%. That takes about 60 seconds. When the fans stopped it is the same, the display changes slowly until it reached 0%. I guess the video BIOS (or video driver) controls the fans in a way to make the duty cycle drops or increases smoother than on other video adapters. We've experienced the same behavior on certain video adapters, albeit it wasn't that slow of a process to drop or increase the duty cycle.